Trim the asparagus and discard the woody stems. Heat the diced bacon in a cast iron skillet and cook on medium heat for 4 minutes or until crispy. Remove bacon pieces from skillet, leaving the drippings. Add the asparagus to the hot pan and cook until asparagus is crisp tender, about 5 minutes (depending on how thick the asparagus is). 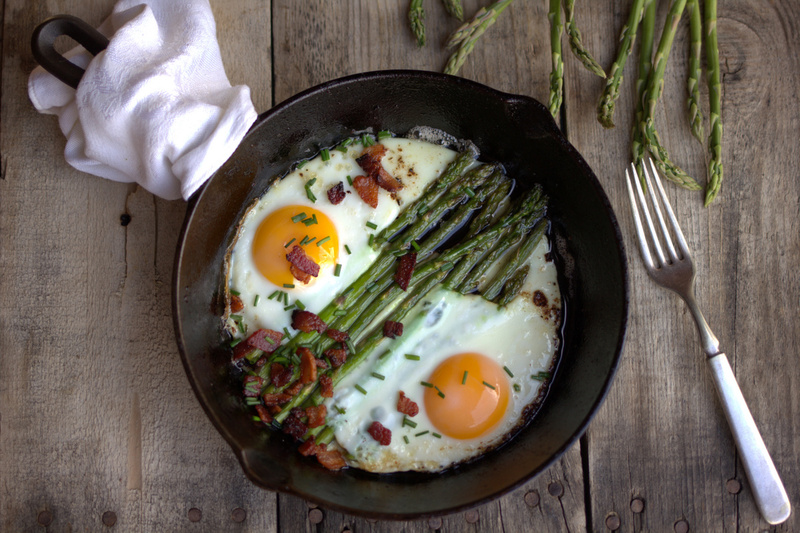 Crack 2 eggs over the asparagus. Sprinkle with chives, salt and pepper. Saute on medium-low just until whites are set and yolks are soft. Add diced bacon and serve. Best served fresh.